Prisons are state and federal institutions used to incarcerate convicted felons who are serving a sentence of more than one year. Throughout the duration of imprisonment, inmates are involved in required activities and are provided with the opportunity to participate in optional activities for their physical, mental and spiritual health. 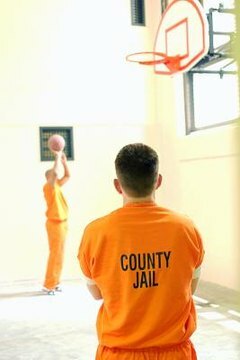 To assist in decreasing levels of stress and violence within the prison, sports and recreation activities are available to inmates. Options include basketball, tennis, billiards and puzzles and games. The activities are designed to promote healthy lifestyles in an effort to decrease medical costs. To encourage positive social skills, the prisons provide team sports while exercise programs offer a means for the inmates to develop a positive self-image. Common daily activities revolve around working within or around the prison. Duties include working as part of the kitchen staff, working as orderlies or working as custodians. Due to wall deterioration from moisture, inmates removed portions of the South Dakota State Penitentiary stonewalls as a work opportunity. Laundry and cleaning opportunities are available in some prisons to increase the activities available to inmates. Some prisons train inmates to reduce the feeling of hopelessness that can be found in a prison environment. Prisons offer educational opportunities for inmates to improve themselves and assist in preparing them for the return to normal society. Programs are available to assist with reading, math and language skills. These programs allow inmates the opportunity to gain a high school diploma while incarcerated. Additional programs allow for inmates to receive courses in life skills, including computer literacy, parenting, anger management and victim empathy. The year 2009 saw some changes to the educational programs to inmates, with the addition of postsecondary vocational certifications at the Utah Department of Corrections. Programs include residential construction, automotive and culinary arts. Prisons around the country provide religious programs and activities, with some prisons recognizing more than two dozen religions. To address the spiritual needs of inmates, activities include worship services, religious courses, prayer services and scripture study courses. Some prisons provide chaplains to assist inmates with crisis intervention and to assist them during times of personal crisis. Faith, Rosenya. "Activities in Prison." , https://legalbeagle.com/8012878-activities-prison.html. Accessed 25 April 2019.